Copyright 2010 Lemire's Plugworks: Saltwater Lures. All Rights Reserved. This is a sinking chubby needle that has a moderate to slow sink rate and sinks tail downward. A slow retrieve will glide just under the surface of the water. I also recommend twitching the rod every 5 or 6 turns of the reel. You can also let it sink to the bottom and work it like a sand ell hatching. This needle can also be worked fast like a pencil popper. Making legend on Block Island over the past couple of years, this plug has caught many a fish all over the island and up and down the coast. The same retrieve as the stubby will produce great numbers of fish. Also slow to moderate sink rate, with tail down, this needle will attract big bass. Slow to moderate retrieve while twitching the rod every 5 or 6 turns will leave a nice wake as it glides just below the surface of the water. For further information on these or any of our other fishing plugs, please do not hesitate to contact Lemire's Plugworks. 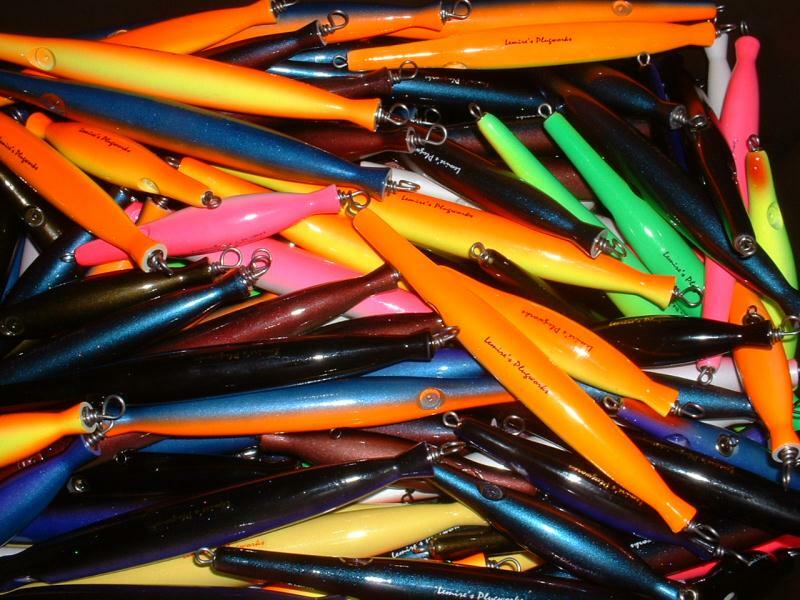 Ideal for big stripers and bluefish. "We were fishing a dropping tide at Cutty on our last night. Fishing this night was very slow to say the least. We had half a dozen bumps between the 3 of us with no hookups. As we were getting ready to leave around midnight I snapped on your needle and stepped onto a rock my buddy had just been fishing for three hours with zero to show for it. On my second cast I connected with a nice keeper bass making my night much to the chagrin of my fishing partner. They work!! "